For a description, see here. - LetsReadDB : 20 hours of reading speech of 284 children. - voc_CETEMP_40k.txt : the 41586 most frequent Portuguese words in CETEMPúblico corpus. - dic_CETEMP_50k_mc_v9.txt - The most recent dictionary for continuous speech, with semivowels and vowel stress marking in SAMPA; some alternate pronunciations (separated with ";"). - dic_CETEMP_50k_ipa_v9.txt - Same in IPA. - dic_CETEMP_50k_mc_v6.txt - A version with few semivowels, in SAMPA. - dic_CETEMP_40k_alinhado.txt (with alignment between graphemes and phonemes; uses single-char symbols for phonemes according to a convention). - dic_CETEMP_40k_alinhado_digrafos.txt (with grapheme-symbols for digraphs). - dic_CETEMP_40k_alinhado_digrafos_nao_nasais.txt (not using nasal digraphs: an, am, en,...,um). - dic_CETEMP_40k_acentuado_alinhado_digrafos.txt (with vowel stress marking and symbols for digraphs). - Minimal Pairs: pairs of words in Portuguese, which differ in only one phoneme. Each line in this file has a pair of words followed by the corresponding pair of transcriptions. A more complete list is here. - Executables (win) in 32 and 64 bits to convert a given voc. file to a pronunciation dic. and to train a model given a dic. file. - n-gram models (for n=2 to 8) for dic_CETEMP_40k_acentuado_alinhado_digrafos.txt (open folder; the first lines of these files show the possible pronunciations of each grapheme). - Records utterances from prompted sentences/commands shown on the screen. - Speakers can read the sentences "Off-air", before starting the utterance recording ("On-air"). - Requires .NET Framework 3.5. - The .msi installer is here. 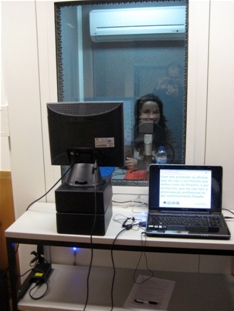 Our lab has a soundproof booth (Absorsor ABSLOC.15 cabin with 130x124x250 cm) for high quality recordings of speech. If you need to use this facility, please contact us.